We parked in a gravel parking lot next to the gift shop and then signed in. While we were waiting on the tour to begin, the girls enjoyed looking around and even got to catch a glimpse of a baby alligator and turtle in the back of the shop. There were about five other kids in the same tour group. We boarded a canopied boat and the tour guide steered us downstream where we had our first encounter with an alligator. Everyone was awed by this magnificent creature. He was approximately eight feet long. Katie, our oldest, enjoyed learning about the alligators’ diet, the difference in size between male and female, their mannerisms, etc. We could ask our guide any question and he had an answer for us. Although Rebecca, our youngest daughter was scared for the first few minutes, she relaxed and even laughed when the guide brought out marshmallows and hot dogs to feed these creatures. Our tour guide led us upstream to experience more of the swamp in its true form. In fact, that day we must have seen at least twenty alligators. Along the way, our guide stopped many times to point out different birds, trees, plants, etc., giving us a chance to take pictures and take in the scene around us. He provided information about the plant life and ecosystems throughout the swamp. He shared his experiences as a guide and his appreciation of the magnificent wildlife… from the 12-foot alligator to the Blue Heron hidden in the remote channels of the swamp. He told us stories about the people that lived in the house boats. Rebecca was given the opportunity to feed the alligators, as was anyone who wanted to participate. The guide gave her a stick with a marshmallow or a hot dog at the end and helped her hold it close to the water. The alligators would catch the scent and come in for the bait. Although our oldest daughter, Katie, never fed the alligators, she was excited to see their mannerisms and still loves to retell the story of the guide putting a marshmallow on one alligator’s head, only to watch the creature swim in circles trying to find the source of food. Overall, the tour was about an hour long. 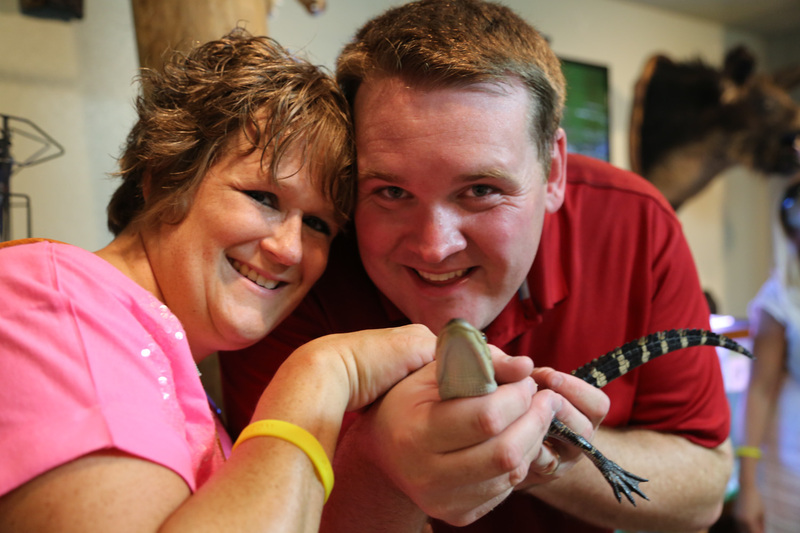 Afterwards, everyone was given the opportunity to hold a baby alligator or turtle in the gift shop. The girls learned so much and are eager to go back, next time with their brothers. We weren’t sure the boys were old enough to appreciate the tour, but later discovered we should have included them.